I really like finding out new things and the past several days were filled with happy discoveries. 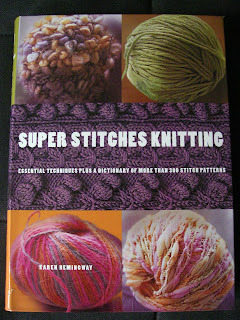 Hemingway's "Super Stitches Knitting"- a gift from my non-knitting coworker. I have been looking at stitchionaries available at the bookstores and on Amazon for a while. I am not ready to design my own sweaters yet, but I would like to try my creativity and knit a scarf or a headband using different stitches. "Super stitches knitting" seems to be perfect for that. The book is divided into sections including: "knit and purl", "lace", "fair isle", and so on. It also has a section with tips and instructions on casting on, binding off, colour-work, and fixing errors (that one will be useful). I can not wait to create my own project using some of the stitches from the book and I think I know what it might be. The second discovery was a long awaited first issue of Debbie Bliss magazine. There are several interesting items in this magazine and overall presentation and design are very beautiful. I think Debbie Bliss magazine will be one of my favorites. The last 2 discoveries were online magazines. The Inside Loop - UK based knitting magazine and Knotions. Both look very interesting and I will be spending some time reading the articles and choosing patterns I like. There was actually another discovery or should I say an acquisition (yet another gift) but I will dedicate a separate post to it once I take proper pictures. I just got the Debbie Bliss magazine, too and I love it. I'm enjoying reading your blog and so I've nominated you for a Brilliant Blog Award. Details on my blog. The book is so pretty. When you showed it to me I actually though for a split second to start knitting! I just gone through your different blogs. It was reall interesting to read your article. You deserve the award that you have got. Keep it up the good work. Why do I like the new Debbie Bliss magazine?